Phaenithon semigriseus (Anthribidae) - Parque Municipal, Distrito Barão Geraldo, São Paulo, Brazil. ID by Jose Ricardo M. Mermudes. Over the weekend during my trip to Brazil last month, I took a walk in the municipal park near my colleague’s home in Barão Geraldo. There was a rather large lake with a walking trail going around it, and although much of the vegetation was planted, there were some less kempt and more native-looking sections along the trail where I hoped to find some insects to photograph. As it turned out, there weren’t a whole lot of interesting insects, but I did see a capybara (“capivara” in Portuguese) – the largest rodent species in the world (picture a guinea pig the size of a small real pig) – for a brief moment before it splashed in alarm into the lake and swam away. One of the few interesting insects I did see was this little fungus weevil (family Anthribidae) on the bark of a large, recently felled tree. At only ~3-4mm in length, it was a rather tiny species as anthribids go – especially in the tropics – and lacked the comically elongated face that some species possess. Still, there is something humorous in its portrait. 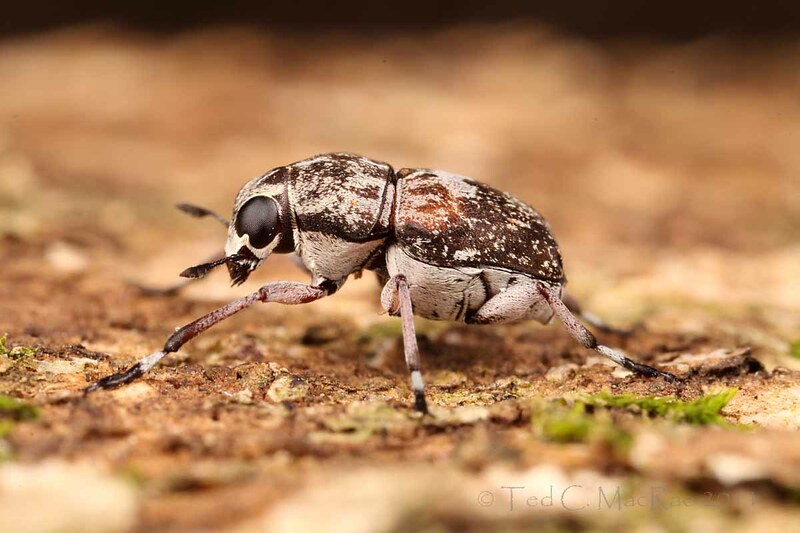 Fungus weevils differ from true weevils (family Curculionidae) by having the antennae unelbowed. I have no clue about the identity of this individual below family level, and there don’t seem to be a whole lot of entomologists that study this group of weevils (should anybody have a clue, please do leave a comment). I simply must post these photos, however, because I think it is the first time I actually nailed the focus right on the eye with a closeup of this magnitude (~3X). I actually took some closer shots also (in the 4X range), but I really didn’t care for the composition with the lens zoomed in to that degree. Update 02/17/11, 9:53 a.m.: I just received an email from Jose Ricardo M. Mermudes (Universidade Federal do Rio de Janeiro), who informs me that the species is Phaenithon semigriseus (Germar, 1824). It would seem that this photo at Coleoptera Neotropical has, until now, been the only image of this species on the web. My thanks to Dr. Mermudes! This entry was posted in Anthribidae, Coleoptera and tagged beetles, Brazil, entomology, insects, nature, science, weevils. Bookmark the permalink. 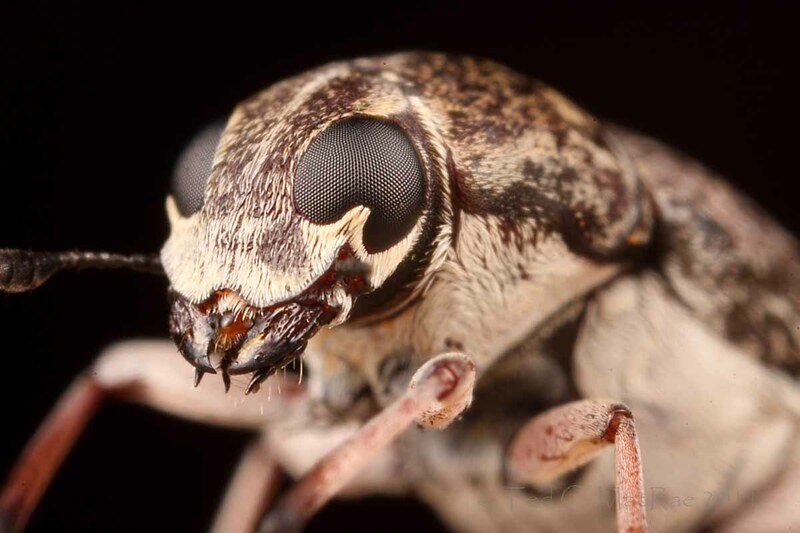 Really fine shots of this photogenic fungus weevil. I esp like the 2nd shot. Rather different from the ones with longer snouts we have here. I’ve been looking at some of those long-nosed species in your area – they are extremely photogenic! Nice! I really like the lead shot. It’s a must-post not only for the focus, but because the little guy is such a great character! Glad you think so – I’m probably too hesitant to post photos of unidentified insects. That’s the happiest looking weevil I’ve ever seen. You’re right – he’s smiling! The shape of the eyes reminds me of highlights in the eyes of a cartoon character. And, I’m with Bryan — Positively jolly looking! There’s definitely a cartoonish quality to this guy that I probably wouldn’t have noticed just looking at a pinned specimen under the microscope. You know, I’m all for flashy colors and patterns, but I have to admit the low-key earth-tone thing going on here makes this a very handsome insect. And that second photo… Wow! Totally fantastic! The little bits of green do add interest to the first photo. Yep, I’m quite proud of that second one (and I only say so because I don’t often feel like I nailed everything in a photo). Spectacular images! Barry Valentine would be the person to ask about the id. Thank you, Margarethe. Barry Valentine doesn’t have email (or at least doesn’t give an email address on the membership section of the Coleopterists Society website). Fortunately, Dr. Jose Mermudes provided a quick ID, and Charlie O’Brien also wrote to me in agreement with Dr. Mermudes’ opinion. Dusty looking little guy. I’m in awe of how detailed the eyes are in that photo. And how cool they look! Hi Ted, how exciting to have traveled to Brazil! I have not been by BitB in quite awhile, looks like I’ve been missing out. Fantastic focus on the weevil. It looks like tufts of hair partially extend over the eyes. Or I wonder if the eye is just oddly shaped. Enjoyed the photo! Hi Amber – nice to have you back. It was quite a trip, and I still have lots of photos to share. Beetles do not have “ears” in the sense we think of, but rather sense air vibrations and shocks through their bodies, as in fish. It’s possible there are auditory organs on their antennae, though I don’t know about this for sure. At any rate, the eyes are naturally shaped like that. Best. Fantastic portrait (you DID nail that shot). I love the spines emarginating the eyes, they add a lot of character to an already charismatic little guy!